We train you in our training center. For the participents we have powerful workstations. We can coach up to 8 persons at the same time. Groups of maximum 4 participents are ideal. The training is highly related to practise. After teaching the basics the participants do exercices. Accordingly the exercises will be coordinated to your workpieces and processes. Knowledge and skills in the usage with PC und MS Windows®. Robot knowledge is also a precondition. 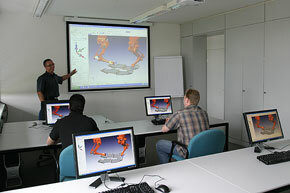 Additional to our software training we offer robot training in our company. 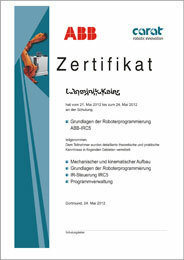 Therefore we have a ABB and a KUKA robot with different toolins etc. You'll get appointments on demand. Please get early enough in touch with us so that we can consider your request! The booking can be carried out only if a written order is existing. 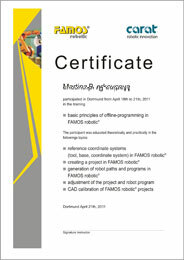 At the end of a course each participant will get a certificate about his qualification. Participants who couln't reach the course goal based on the one hand on insufficient previous knowledge or on the other hand on cummunications diffuculties, will get an confirmation of participation.